It restores and replaces teeth. This includes crowns, bridges, dentures, and restoration of dental implants. Zirconia is a very hard ceramic that is used as a strong base material in some full ceramic restorations. Dentures are removable replacement for missing teeth and help restore your smile. Complete dentures are used when all the teeth are missing, while partial dentures are used when some natural teeth remain. The resin composite filling(white filling) is a tooth-colored plastic and glass mixture used to restore decayed teeth. Composites are also used for cosmetic improvements of teeth by changing the color of the teeth or reshaping disfigured teeth. The amalgam fillings are also known as “silver fillings” because of their silver-like appearance. Dental amalgam is a mixture of metals, consisting of liquid (elemental) mercury and a powdered alloy composed of silver, tin, and copper. 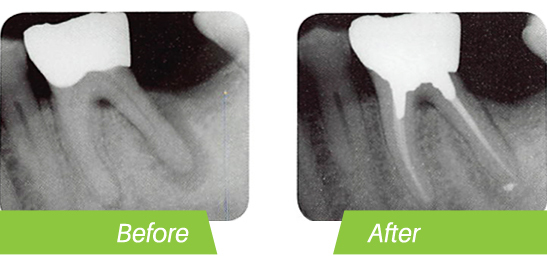 The endodonitst removes the inflamed or infected pulp, carefully cleans and shapes the inside of the canal, a channel inside the root, then fills and seals the space.